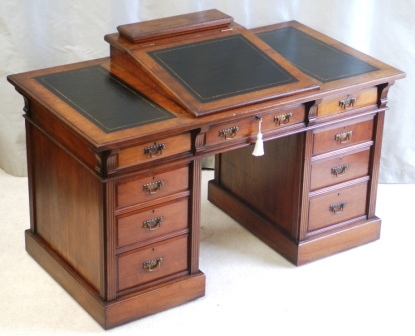 Superb Antique Walnut Dickens Writing Desk. Stamped by the maker "Bulstrode, Cambridge". Excellent tooled black leather writing surfaces, original glass ink pots, brass handles and brass lever locks with key. Total of eight drawers each with hand cut dovetails and dust mouldings. Fitted interior to the slope with pigeon holes etc. Concealed brass castors and wheels. A truly excellent desk. Makes a very good work space with the writing slope serving as an excellent laptop location. Three piece pedestal desk construction for ease of transport.